Thanksgiving is so close, you can almost smell the turkey. Instead of waiting two whole weeks, we’ve got a few exciting releases that are here much sooner than the food coma festival approaching. Listen to throwbacks from a country phenomenon reimagined by… well everyone, a live album from a rap natural and a rock group that’s back with a thoughtful and chilling sound, all out today. Tracy Lawrence is back with an album of his greatest hits as well as two new tracks. But there’s a twist: Tracy’s songs have been covered by the who’s who of country stardom including Jason Aldean, Luke Bryan, Big & Rich, Tim McGraw and many more. 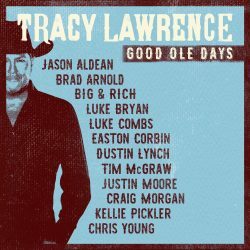 Everyone came together to celebrate the Good Ole Days and contribute to an incredible release via Lawrence Music Group. Check out the preview below and get the full album here. Sleigh Bells returns with a mini-album thats proves to be just as powerful in sound but perhaps more so in lyrics. The self-released album, Kid Kruschev, is packed with deeply thematic and poetic tracks that intrigue and provide intense insight into the mind of the writers, Alexis Krauss and Derek Miller. The duo filled every second with imagery, scoring their own emotions with a simple and eerie rhythm and distorted echo on single “And Saints.” Watch the chilling and ethereal video below and get the full album here. To know Oddisee is to love Oddisee. We’re happy to tell you he is back with a live album alongside his band, Good Compny. After touring and promoting his recent album, Iceberg, you would think Oddisee would take a well deserved break. Well, think again because the smooth talking rapper has more music to share, fresh off the tour bus. Check out Beneath The Surface for a raw example of the talented team, out now via Mellow Music Group. Watch a previous live performance of the magical pairing below and get pumped for the new album, out today.